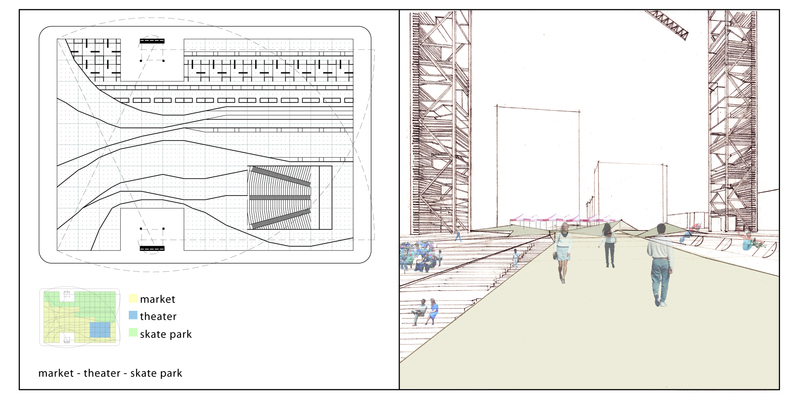 IDEAS COMPETITION ENTRY BY ANDREW WATKINS, JEREMY MUNN & JOSHUA CAMPBELL. SPONSORED BY LA HUB H*URBAN BUREAU OF LOS ANGELES CA, DECEMBER 2002. Los Angeles Means. 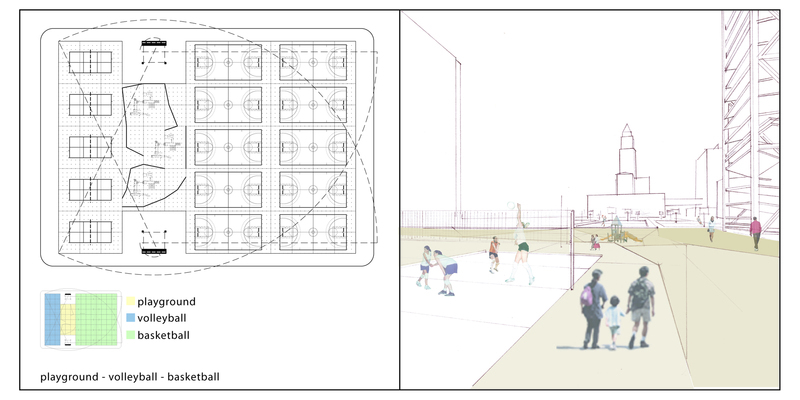 . .
A horizontal system of overlapping street grids that delineates the city’s surface into an expansive field of varied program. A majority of housing stock and infrastructure is manifested as one or two story unit single-family homes, with autonomous sections of land, creating thousands of independent microcosms; about 99% of this is a horizontal organization. Most individual single-family homes are organized exactly the same way-switching two nearly interchangeable plots would change little regarding land use other than ownership. A resultant of the city’s method of delineation is an anarchic system of surface manipulation. Modern Manifest Destiny: a plot of land to each; individual land ownership and the “right” to manipulate that space as one see fit. 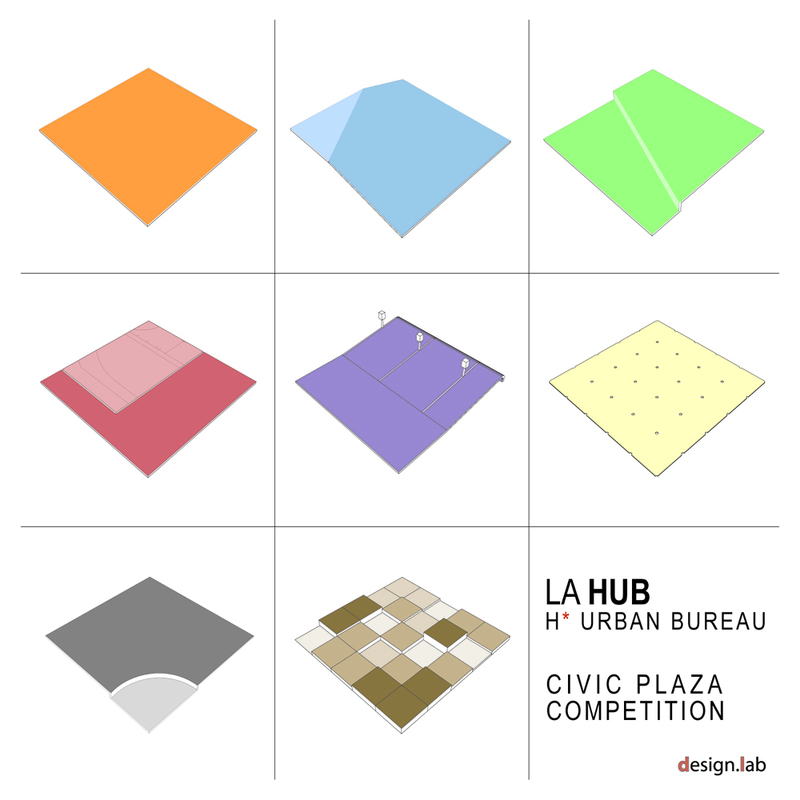 The civic plaza is sectionalized into 30’ x 30’ horizontal plates covering the entire area of the plaza, each with its own individual identity and programmatic use. They can be manipulated around the plaza and changed, as surface programming deems necessary, and will be organized and orchestrated by advance request to city officials. Multiple functions can occur in the park simultaneously, maintaining plate identity, while always linking together as part of an interlocking grid. Two cranes and a series of underground hydraulic pillars are used to manipulate the plates to and from position to storage. 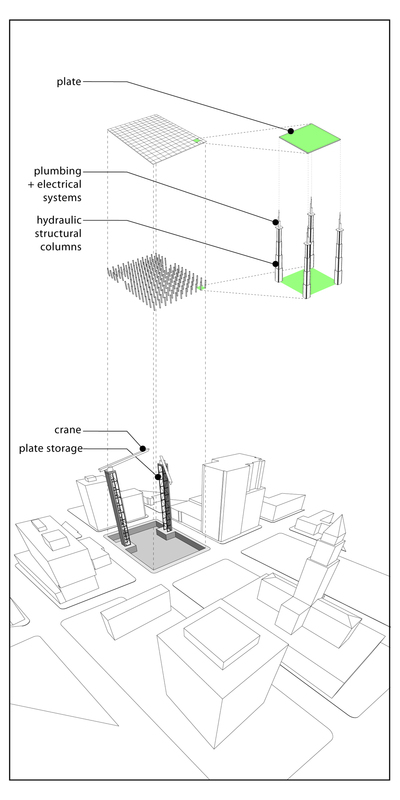 Plates not immediately in use as part of the network of active plates will be stored in slotted compartments in the cranes’ vertical shaft and underneath the plaza’s surface. Plates can be added to the system retroactively, as new uses necessitate. Like the system of interrelated areas that compose a city, each autonomous plate is linked and necessary to the function of the whole. Though all plates can exist on their own, some need to be combined to form a full programmatic element. Depending on the function of the plate, its top physical surface may vary, but these factors remain constant: the way the mechanical systems are integrated, its mode of storage and movement, the size, basic square shape and way they attach to the other plates. 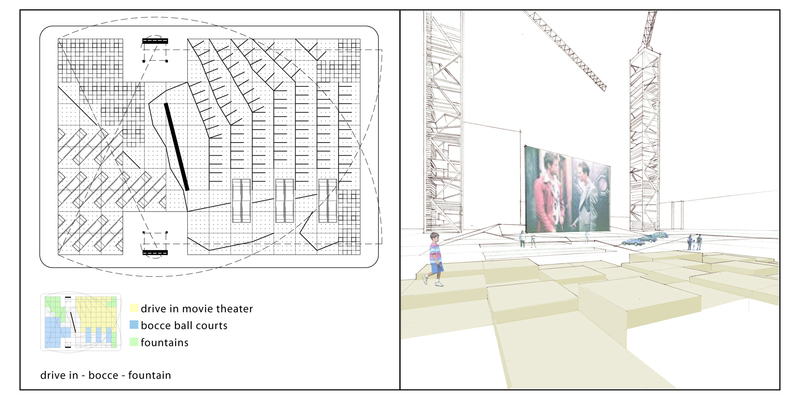 Some proposed elements within the plaza include a skate park, drive-in movie theater, seasonal herb garden, stage platform, sunken amphitheater, basketball court, hockey rink, hopscotch, bocce ball court, fountain, life-size chessboard, mural—however, peoples’ imaginations are the limit.